James Troup (elmo) added you as a member of Canonical (canonical). My involvement with Canonical actually started much earlier than this. Back in 2004 I noticed Steve Alexander connecting to an IRC channel from a brazilian IP. Curious, I asked what he was doing here and to my surprise he was at Debconf, in Porto Alegre. I rushed there to meet him, since we hadn’t met in person before, and ended up meeting some of the first Canonical employees. Actually, Canonical didn’t even had a proper name back them, I believe. And neither did Ubuntu. In the room were a bunch of Launchpad developers, and I remember they were putting up suggestions for the name of the soon-to-be-created Debian-derivative distro in a blackboard. Maybe someone has a picture. I certainly should have snapped one.One of the libraries I had created was being heavily used by Launchpad, and Steve invited me to join the team. Unfortunately I had just started at a new job a couple months before. And the whole ‘we are going to create a new distribution based on Debian’ sounded kind of bonkers anyway. I ended up referring Christian Reis, which as I learnt later managed to meet Steve and Mark Shuttleworth at the airport in Guarulhos in between flights. Regardless, I stuck around to see Mark’s talk on his space trip. The most impressive part was definitely his description about reentering Earth’s atmosphere. Since young age I always dreamt of being an Astronaut. Meeting one in person was probably the most significant event in my life until that point. Time passed, and Kiko tried to convince me several times to join the Launchpad team in the years that followed. The only reason that I didn’t do so was because he wanted me to move to his town, Sao Carlos – SP, even though most of the Launchpad team was distributed. Fast forward a couple years, and I decided it was time to move on from my job at Enfold Systems, where I was responsible for maintaining several products that integrated the Plone CMS with the Windows platform. What a bold change it was, going from being practically a Windows developer to working with the company behind a Linux distribution. 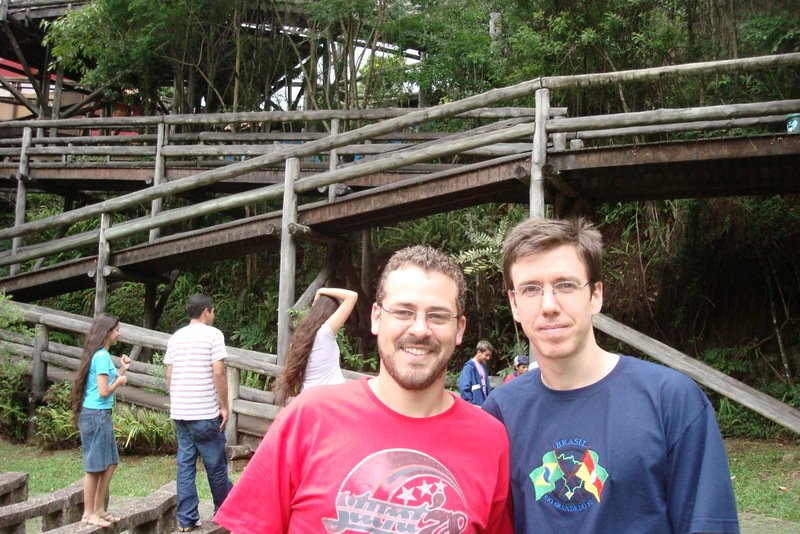 My time at Canonical started with a ride from Porto Alegre to Curitiba with Gustavo Niemeyer, my soon-to-be boss. We actually had to take a long detour all the way to Lages because BR-101 flooded near Ararangua. Luckily Gustavo had his GPS with him. As the facelift started winding down I started focusing on gathering a good set of backend metrics, of which we had none. I introduced the use of Graphite to the team, which unfortunately didn’t hit production in time. I created txStatsD in the process. I wanted to learn more about how things actually worked in production, how things were deployed, and if there was anything we could do to improve. The right opportunity revealed itself in the form of an open position as Operations Engineer at the Ubuntu One team. In Ubuntu One, they already had Graphite running in production, with a minimal set of metrics. So we started adding more and more, and the more we added, the more production issues we uncovered and fixed. I had my first real taste of a metrics-driven operations process and nothing could stop me from wanting more. A couple years later, and all the hard work paid for itself. We went from being the group with most production incidents and recurring issues to being a reference within the company. Trailblazers in DevOps, so to speak. Services that were deemed complete failures and ripe for a rewrite from scratch got ironed out until they ran smoothly for months without incidents. We were amongst the first to put Juju in production and are probably the team with most Juju-deployed production services to date. We got the new app store for Ubuntu Touch from nothing into a Juju-deployed production service just a couple months. It has been an amazing ride. I’ve traveled to many countries and met some of the brightest people I’ve had the chance to work with. I’m really proud of what we accomplished as a team, and what Canonical has accomplished as a whole. I have faith that 2014 and the years to come will only see more and more of that. To me and Daiane, 2014 is a year full of milestones. 5 years at Canonical, 10 since I first heard of it. She is turning 30 in March, also the month we complete 10 years of being married. In June we’re celebrating 15 years together (yes, we started dating when she was just 15!). 2014 also marks 10 years since we’ve traveled together through Austria, Germany and the Czech Republic, and the stories from that trip are among the most memorable we had. This year we want to do great things, like we did in 2004. Things that we’ll be talking about for the next 10 years and even longer. Shake off the dust and blaze new trails. Get out our comfort zone. We’ve got some changes lined up, but this is not the appropriate time to talk about them yet. Stay tuned, and wish us luck! This entry was posted in canonical. Bookmark the permalink.